It was like yesterday when we celebrated New Year’s and now we’re entering the second quarter of the year. It had been a very fast three months for me and surprisingly most of my goals for the year are already achieved; add to that a lot of firsts. Get a Garmin. This was at the bottom of my list and was actually optional but it was the first one to be completed. I think of it as a reward after completing 100K race distance last year. Run not only on weekends but also on weekdays (and log it). Sixth on my list and was also one of the first ones I did. Not only did I run during weekdays, I also tried it at night and on sub-zero temperatures. My running logs can be viewed at http://www.dailymile.com/people/dhenztm/. Stay injury-free! Well, so far so good. Set new PRs: 5K (below 20min) 10K (below 50min). With the recently concluded Miracle Run I was able to do a sub-50 minute 10K race. The 5K PR remains elusive but there’s still time to practice! 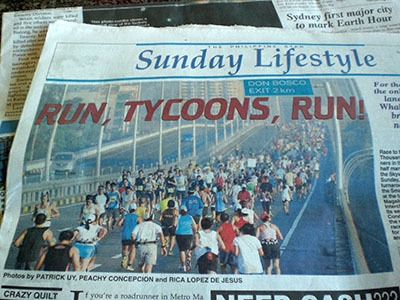 Run outside Metro Manila and hopefully abroad on International Races. Ran outside Metro Manila with TNF Thrill of the Trail; ran abroad in Columbus, Ohio; but unfortunately wasn’t able to do an international race so far. Gain some weight. As of my last measurement I gained 3 pounds. The challenge here is gaining more and keeping it since I’m starting to run long distances. Run my first half-marathon. One of my proudest achievements so far via Condura Run—I had to do it under a different name but the experiences I gained are priceless. Trail run at TNF Thrill of the Trail. Winter run at Columbus, Ohio. It was also my first runs abroad. 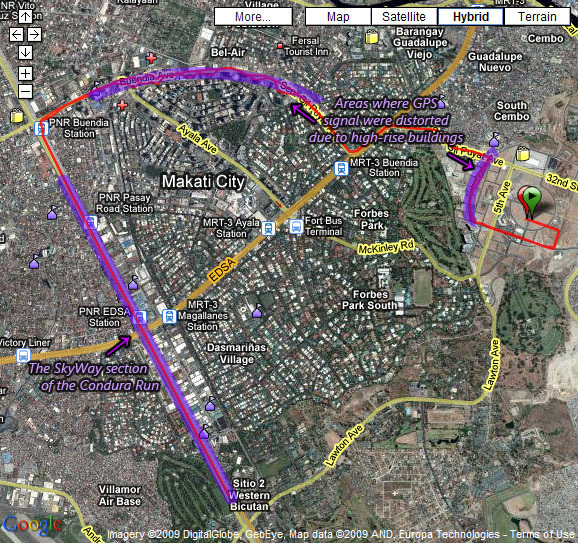 Runabouts on major roads of Metro Manila (starting with EDSA) and with it first runs beyond 21K. Although most of my 2009 goals are achieved I still have a lot of work to do. Being injury-free and gaining (and keeping) weight is a conscious effort and the sub-20 minute 5K would really need a lot of practice. It seems that the “easy” part of the list is done; now the real work begins. “Don’t rest on your laurels.” We should always strive to be better today than what we were yesterday, and in this case just continue to set new records and get new “firsts.” Chasing after your goals isn’t easy, and partially fulfilling them is not “good enough.” And even if you complete your goal it’s not a sign to stop, but instead a sign to take it to the next level. How about you? How’s your 2009 goal list doing? The Men’s Health Miracle Run would always be a special race for me and many of my friends as this was our first race ever when it started last year, just a couple of months ago. Now on its second time around it’s only natural for me to return to the race that started my passion for running—like a homecoming. Venue. One of the most significant changes for this race was the venue: UP Diliman. 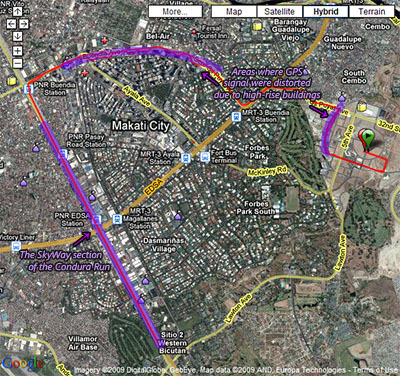 The previous race was held in Bonifacio Global City and the move to UP was a welcome change. I was hoping for a “nostalgic” run but since it’s on a different turf, getting fresh memories would suffice. Shirt. Miracle Run has been known to have one of the best race shirt design last year and this year was no different—except that this year instead of a shirt the organizers shifted to singlets—a pretty smart move considering the hot temperature at this time of the year, although I missed the shirt which I was able to wear on other occasions as well. Team Race. When we first ran the race we were intimidated by 10K so most of us opted to join the team category and run the distance as a relay. Each member would run 5K but the downside was waiting for your partner. This year there’s still the team category but now it’s a tandem race—no more waiting! Each one would still run 5K but running in tandem allows the team run as a team. Race Bib. No more tarp race bibs! Finally the race is at par with most races when it comes to race bibs. I’ve heard that the tarp bibs were one of the causes of delay in releasing race results that have plagued all races initiated by Men’s Health (in fact the race results for Men’s Health Urbanathlon held November last year is still unreleased as of press time). We’d still find out if this move would improve the speed of generating race results. Survey Forms. This race was the first race I had where the organizers were actually interested about how we assess their performance via survey forms. Finally we had a way of sending our comments directly to them so they may improve their future race. The only problem I found about their survey form was asking participants to assess something that has yet occurred (e.g. how do we assess the speed of race results when it’s not yet available?). I hope many future races adopt this idea—an online feedback could be better to reduce paper wastes. UP Diliman is always a good place to put a race—it’s cool, clean, and could be challenging depending on the route you take. The route that Men’s Health chose for this race was excellent! It’s very interesting and fun, definitely not a walk in the park. As much as I enjoyed running the interesting route my GF405 can be a bit of a kill-joy. I crossed the finish line at a new 10K race PR of 48:38 (unofficial, based on the race timer) but when I checked my GF405’s stats I was a bit off. From the start I was a bit skeptical of the 5K route (10K race was 2 laps of this course) being actually 5 kilometers and unfortunately I was right. To those who want to savor their 10K race don’t worry I won’t spoil the fun but if you want to see the actual distance as logged by GF405 hover your mouse here. Because of this “short” issue I don’t really know if I should consider this as a new 10K PR per se. Had the course actually be at least 10K, I may not be able to get a new PR based on my actual pace. To be on the safe side I’d just refer to this as a new “10K race” PR. One of the things that Men’s Health’s races badly need to improve is its punctuality. Every runner that joined the race made an effort to be up early to be on time for the race so it’s a grave disrespect to everyone’s time if you don’t start on time, especially when you claim “race starts promptly at….” It’s one thing if a runner was late for his race but it’s another if the actual race was late. I really liked the improvements Men’s Health made with this race; I hope this could be a sign of better races to come. Still this race has a lot of room for improvements and I hope our feedbacks really reach the proper authorities. Water stations: Water adequate, cups not. 10K runners weren’t able to get water on their 2nd lap because the cups ran out. Race Route: Excellent, very good degree of difficulty (no shame if you don’t have a new PR) but some distance off. Punctuality: Poor. I can’t believe that it was half an hour late! 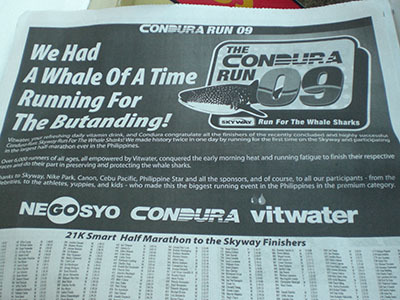 As promised by Condura, the results of the Condura Run 2009 were published in today’s circulation of The Philippine Star, Sunday Lifestyle section, K-1. Note that this list includes all finishers in 21K, 10K, 5K, and 3K. Congratulations to all finishers! Be proud of being on this list! This weekend packs an interesting set of races for both the men and the pinays: Men’s Health Miracle Run and Senator Pia Cayetano’s Pinay in Action. March being Women’s month, it’s only fitting to have the last weekend pay tribute to women, and see the Pinays in action. The Pinay in Action All-Women Run would be held at the SM Mall of Asia and features a 1.6K, 5K, and 10K run. Men are welcome as well, although not eligible for any awards, and must register with a female participant. The 1.6K fun run is a team run: one adult with a child 12 years old and below with at least one female member (e.g. mother-son, father-daughter, aunt-nephew, etc.). The team would run the distance together as a team. The 5K and 10K run are individual runs. The 10K run would start at 6AM and would do 4 loops of the 2.5K route, and the 5K 5 minutes later with 2 loops of the same route. 1.6K would start at 6:20AM. You may still register on-site if you still haven’t done so but it would cost an additional P100 extra. As for men, fear not, we’re not left out in the dust. The Men’s Health Miracle Run is for everyone regardless of gender despite its machismo name. This is a race for the benefit of Tahanang Walang Hagdanan’s “Gulong sa Pagsulong” Mobility Aid assistance program that provides wheelchairs to people with disabilities and would be held at UP Diliman. The race features a 10K individual run and a 10K team run. The 10K team run is composed of 2 members running at the same time covering 5K individually. This was a change from last year’s relay-type so now you get to run alongside your teammate. Race starts at 6AM. As a last minute advise to those who would be making this weekend their first race, make sure that you arrive at least 30 minutes before race start and don’t forget your race bib with your race number. Finally, don’t forget to have fun and enjoy the race. Good luck to all the weekend warriors and have an injury-free race! These are overall results for the 5K, 10K, and 21K so it’s not grouped by gender, only sorted by time, courtesy of www.condurarun.com. It’s a good chance to see how you fared overall. As a running bandit I don’t have my real name on the results, but I’m in there with an official time of 2:07:52, 492nd out of 1,317 runners for 21K. 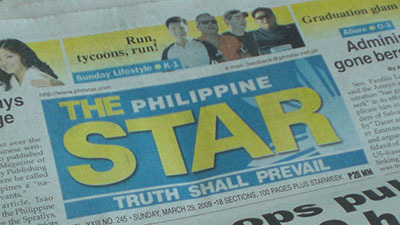 Expect these results to be published on The Philippine Star on Sunday, March 29, 2009. Congratulations to all the finishers! The Condura Run last Sunday was easily one of the best races of the year not only for its historic SkyWay route but also in terms of how well it was organized. To the organizers, especially to the running brothers Patrick and Ton Concepcion, thank you for making this great race possible and congratulations for a highly successful event! This race officially marks my half-marathon debut. I’ve had LSDs longer in distance but you can’t really compare it with a real race. This was actually the longest time I ran continuously almost non-stop, stopping only to get a banana from the takbo.ph support van and when the traffic light halted our run for a few seconds. Coming to this race I wasn’t even sure how long I can keep running without walking since I was getting used to the relaxed pace of LSDs. In one of my earlier post I mentioned about a possible sponsorship for this race. I was assured of it and thought that it would be all settled, until less than 24 hours before the race—I got the bad news that the sponsor didn’t “just do it” and discontinued the sponsorship. By that time it was already too late to register! Five days before the deadline of registration I was set to do just that but I was informed during our Run Clinic that the sponsor agreed to fund our race, being part of their Run Clinic and being one of the sponsors of the race. I, together with a few fellow unregistered runners that time, even filled out the registration forms for the race thinking that it’s all set. Friday was the next session of the Run Clinic—when the bad news was spilled—no sponsorship! Those who attended that Friday’s session were lucky enough to register, it was the last day! I, on the other hand, thinking that everything was set, was on the other side of the Metro joining my friends from takbo.ph for a carbo-loading party. Who would’ve thought that a big company and a major sponsor of that race would back-out of their words? When I received that news less than a day before the race I was stunned—this was one of my most anticipated races of the year and I was preparing for this for a few months already… for me not to be able to join this race, it’s not an option! What is a running bandit? A running bandit simply is an unregistered runner—running the course but didn’t register accordingly. It’s not strictly illegal, but it’s not something you’d want to do (often?). I decided that being unregistered was just a “minor setback.” I’ve waited for this race for so long that I won’t allow some setbacks to stop me from running, so being a running bandit was my last resort. The moment I got the bad news I immediately talked to Coach Rio and asked for some help. I was really worried then and I knew that he has his hands full that time so all I can do was to hope for the best and prepare for the worst. In preparing for the worst I found refuge in prayers. I prayed that everything would turn out fine. God knows all my efforts leading to this race and I know He won’t allow it to end like this—and it didn’t. How to spot a running bandit: No race bib! Thanks Que for the photo. This was the first time I joined a race that I knew a lot of people—mostly from takbo.ph and the runner’s blog community. When I started running it was just some of my friends and officemates and now I’m running with people that shares the same passion as me that not so long ago were mere strangers. This was probably the most fun I had in a race, I was running alongside friends and cheering some along the way—it was a very nice feeling that you’re not running alone. The race started 5:30AM for 21K and the turnout was huge! Considering that 21K is not a walk in the park I was really surprised how much people, men and women, joined this race. The race was very competitive and, as much as I don’t want to admit it, a lot of women were actually faster than me. It was one of the most organized races I’ve joined. The water stations were placed well, people manning it were very helpful, signs were placed well, a lot of emergency personnel, and there’s even a little shower on the SkyWay. As for the route, I guess it speaks for itself—historic. The 21K route was interesting and had a very good degree of difficulty. It was a nice day for a race. The sun was rising by the time we were on the Skyway. Seeing sunrise behind Makati CBD on SkyWay was a view not to many gets to enjoy. By the time I was midway through SkyWay the leaders were already on their way back! By the time I neared the turn-around marker atop the SkyWay (about 10.5K) I knew that I’m not setting any new PRs (pace-wise) since I was way off my 10K PR. Still since this was my first 21K any time I register is a new PR anyway! Being a tropical country that we are, temperatures easily rise with the sun and by the time I was on my way back to Fort Bonifacio the sun was in my face and it was starting to get hot (good thing I wore my takbo.ph visor). It wasn’t easy running that long continuously but I knew I wasn’t running alone, and that that day was made for me to conquer my first 21K! I finished the race with a time of 2:08:08 based on the timer on the finish line (unofficial). That included the 35 seconds it took for me to get out of the starting line. It was an average pace of about 6:05/km which I’m proud to have sustained for that long. I didn’t get a “dream” time of sub-2 hours but I was able to join one of my dream races, and earned my very first running medal. And I did it all as a running bandida! takbo.ph meets the RunningShield. Very nice to meet you Sir! Thank you to all those who shared their pictures! I actually forgot where I got some of these pictures, feel free to give me a shout out if I didn’t gave you credit.